Sunflowers make a huge statement in a room, having a sunny, bright and very cheery disposition. A sunflower is a tall North American plant of the daisy family and has a very large golden-rayed flower head. They can grow up to 12 feet tall and come in a variety of colors including yellow, red, and orange. Sunflowers are cultivated for their edible seeds, which are an important source of oil for cooking and margarine. The sunflower whole seed is also a snack food and can be used as a peanut butter alternative, sun butter. Have you ever tried sun butter? I love sunflower seeds, they are delicious used in salads or by the handful. And of course, these beauties can be used in home decor to brighten up any room. The bright yellow flower head makes this plant a perfect addition to your Fall home decor. The presence of these flowers in a room immediately sparks interest and feels welcoming. The sunflower is very easy to arrange in a vase, if you have the right type of vase. The huge heads of sunflowers make them top heavy so the key is to place your flowers in a vase which won’t topple over under the weight. Look for a vase that is quite tall, and cinched in at the top so it will hold the sunflowers in place. The wider the opening is to the mouth of the vase, the harder it is to arrange the flowers. If a wide vase is all you have, adding more flowers will fill out the arrangement. The greater the number of stems you have, the more they support/hold each other up, so they won’t be falling away to one side of the container. As with any flowers, recut the stems at an angle and add fresh water to the vase. If you are using a tall container with a narrow opening like I described above, they will easily fall into place once you drop them inside the vessel. Sunflowers look particularly beautiful in these types of containers HERE, HERE and HERE. Having sunflowers in a tall container makes a bold statement and looks beautiful just about anywhere in the home. But sometimes you may want a lower arrangement or maybe you want to use a vase with a wider opening. 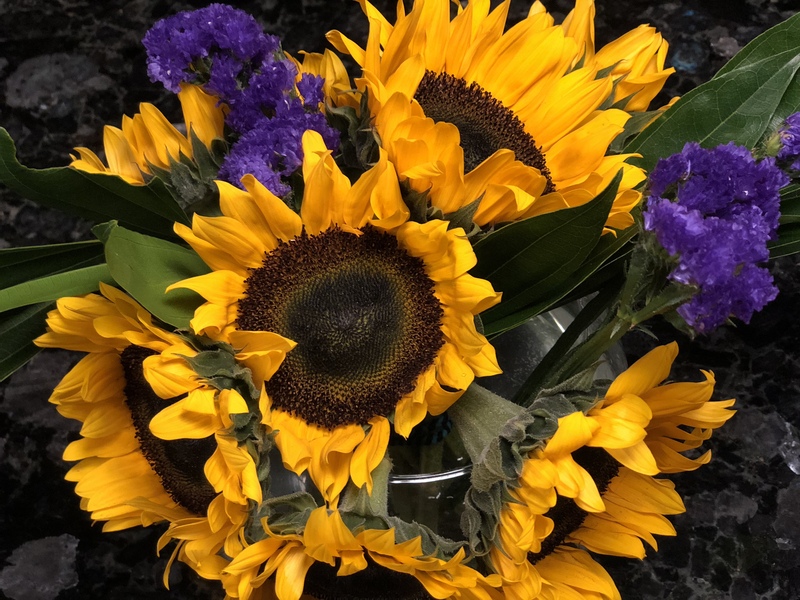 Sunflowers are still a great choice for shallow vases or ones with wider opening, you just have to adjust the way you style them. As I mentioned above, if you have a container with a wide opening, you can add more flowers to fill out the space, or use this simple trick. After cutting off half the stems, (at an angle) – I arranged them in my hand and put a rubber band around the base of the stems. The first time I cut the stems and put them in my vase, I noticed the stems were still a bit too long and it caused my arrangement to topple to one side. I cut a bit more off the stems and they sat perfectly in the vase. It’s an easy trick to use with top heavy flowers and makes styling a whole lot easier. Do you have any tricks for arranging flowers you would like to share? For more informative posts about flowers and gardening, subscribe to Happy Haute Home and follow along on Pinterest HERE, and Twitter HERE and feel free to pin and tweet your favorite pics from Happy Haute Home. You can also get daily home decor inspiration by following along on Instagram HERE. Very cute and refreshing arrangements! Sunflowers and the entire daisy family makes me happy. Hi Lisa! Me too! Just something about the sunflower that makes me smile 🙂 Thanks for visiting!